If you are looking for the best nonstick cookware set to buy in 2018, then you are in the right place. Mistakes do happen and that includes walking into a store and buying the first cookware that looks great on the shelf without any investigation. Many people often get confused on whether to go for nonstick cookware or just the usual uncoated cookware types like aluminum, steel, cast iron, copper and so on. The best way is usually to invest in both of them because there are recipes that are best cooked using nonstick cookware like eggs, pancakes and so on and there are those that do not need nonstick coating like pots and saucepans since the food therein contain liquids. Nonstick cookware is easy to use, clean and healthy in terms of the amount of oil that you can use. This is great as long as you do not heat the cookware empty on a burner and stop using it when it starts to chip to avoid the release of toxic chemicals into your food. So, which is the best nonstick cookware set that you should consider buying? The following list will help you in making a good choice. The T-fal® Ultimate cookware set is sold in different pieces including 12, 13, 14 and 17 piece sets. It ranks as our best nonstick cookware set for many reasons. It is made of aluminum material with hard titanium nonstick interior and an exterior hard anodized aluminum coating with Gris anodized standard color for durability. It uses the unique thermo-spot heat indicator which shows the pre-heating temperature to know exactly when to start cooking. The handles are made of riveted silicone for comfort and safety while griping and are oven safe up to 400F. The cookware is made with TechnoResist Anti-Warp base and is compatible with cooktops except induction. The set includes varying inches of fry pans with and without lids, square griddles, varying quart sauce pans, deep sauté, dutch oven, and steamer together with a one egg wonder. It is also metal utensils and dishwasher safe, high heat resistant and comes with a lifetime warranty. The cookware is anodized and therefore works well with glass stove top. It is made with quality interior and exterior materials hence durable. It is easy to clean given that it is nonstick and dishwasher safe thanks to the hard enamel exterior. It is highly heat resistant and ideal for frying, searing and browning of food. It is safe to use it with metal utensils thanks to the durable and scratch resistant interior. It uses the Thermo-Spot heat indicator which shows you exactly when to start cooking with the cookware. It is strong plus it heats up and distributes heat easily thanks to the anodized aluminum construction together with the TechnoResist Anti-Warp base. It uses vented tempered glass lids that traps heat and moisture for perfect cooking. The silicone handles with end holes are strongly riveted and offers comfortable gripping for safety. It comes with a lifetime warranty which is a sign of a good quality product. The cookware set is light and can slide on the stove top. It is not induction safe and the rivets are not nonstick. The T-fal® Ultimate cookware set has lots of good features that you may need in any nonstick cookware. It is an ultimate collection that is designed for durability, safety, versatility and performance and the majority of users are happy with the product. It is an affordable cookware set that you should not think twice about buying. This 14 piece cookware set contains 1.5 and 3 quart saucepans with covers, 4 quart sauté pan with helper and cover, 9 quart stockpot with cover, 8 and 10-inch open and closed skillets, 20cm multi-steamer insert with cover and a 24 cm pasta insert. It is designed with a three layer construction of pure aluminum core sandwiched between anodized aluminum in the exterior and non-stick quanTanium in the interior. The set has an elegant black and smooth finish, tempered glass lids with a metal rim, cast stainless steel handles that are strongly riveted to the pans and is oven safe for up to 500 degrees F. The set comes with a lifetime warranty. What makes Cuisinart 66-14 one of the best non stick cookware sets? It is made with quality materials like hard anodized exterior that make it durable and comes with a lifetime warranty. It is metal utensils safe thanks to the quantanium interior that is strong and cannot chip easily. The non-stick interior coating also preserves the food flavor and is easy to clean. 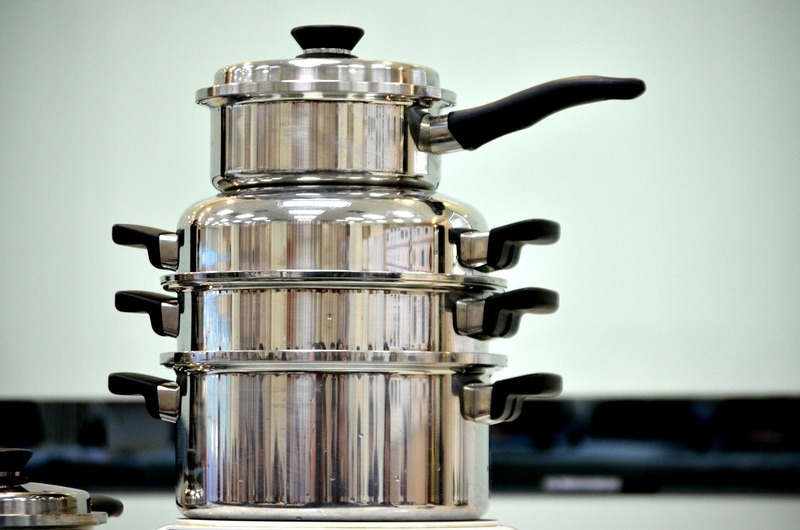 The rims of the cookware are tapered to ensure stress free pouring of food. The stainless steel handles are strongly riveted and contain helper handles and side grips for the perfect balance. These handles are cool and contoured for secure grip. The stainless steel lids fit tightly to lock in food flavor, texture and nutrients and they also have wide, easy to grip handles. It is highly versatile as they can be used on stovetop, in the oven up to 500oF and even under the broiler. It is also freezer safe. It is not induction cooktop compatible. It is not dishwasher safe although many users agree that it easy to clean. You may require pot holders since the glass lids get very hot during cooking. The Cuisinart 66-14 Chef’s Classic Cookware Set is a darling to many users who are happy with their purchase. It is durable, safe, and versatile and brings out the best in any food that you cook in it. The assortment of pans, pots, covers and steamer inserts are all that you can ever wish for in your kitchen. Paula Deen Signature Nonstick 15-Piece Porcelain Cookware Set is eye catching with colored and speckled exteriors. This set contains 1 & 2 quart cover saucepans, 6 quart cover stockpot, 8 & 10-inch skillets, 2.75 quart cover sauté and 5pc measuring spoon set. It has a heavy construction that consists of heavy gauge aluminum sandwiched between porcelain exterior and the long-lasting DuPont Teflon Select nonstick interior. It is touted as an attractive, high performing and convenient cookware set that is a delight of many cooks. It also features glass lids, copper color-accented and coordinated knobs that offer a perfect grip, dual riveted and soft to touch handles with copper-plated hanging rings and oven safety of up to 350oF. What makes Paula Deen one of the best non stick cookware sets? It comes in an array of vibrant colors that will match a variety of kitchen decors. The cookware exterior is not only colorful but also durable, stain resistant and easy to clean. The tempered glass lids lock in flavor, color and texture and allow you to monitor your food without lifting them. It has strong, comfortable and cool handles that offer a secure grip. It is durable and with good performance since it is made with quality materials that heat up quickly and evenly. The glass lids are shatter resistant and fit tightly to lock in heat and moisture. The weigh is just perfect as it is neither too light to look cheap nor too heavy to be cumbersome. It comes with measuring spoons so that you can re-create recipes with the right measurements. Many users feel that the 1 quart saucepan is too small for most cooking needs. The rims of the saucepans do not have a pour spout and can be messy. The Paula Deen Signature cookware set is an attractive set that you may want to have in your kitchen. The cookware is durable, heats quickly and evenly, has strong color coordinated handles and slug-fitting knobs. It is a highly recommended cookware set if you do not mind the small pots. The Circulon® Symmetry Hard Anodized Nonstick Cookware comes in a variety of essential piece sets that make a perfect addition in your kitchen. The 11-piece set contains 1-, 2- and 3-quart saucepans, 8-quart stockpot, 8.5 & 10-inch French skillets and 3-quart sauté with lids. It is dishwasher safe, induction cooktop safe and oven safe up to 400oF. The cookware comes in sophisticated elegant tulip shapes that are made of heavy-duty anodized aluminum. For extraordinary food release and cleanup, the Circulon cookware features DuPont Autograph advanced 3-layer nonstick plus TOTAL Food Release System of circles both inside and out. The handles are made of stainless steel, wrapped in silicone and are oven safe for up to 400oF. It uses tight-fitting tampered glass lids that lick in heat and moisture. What makes Circulon® Symmetry one of the best non stick cookware sets? The cookware comes in elegant tulip shapes that add sophistication to your kitchen. They are durable being made of heavy-gauge anodized aluminum that is twice as hard as stainless steel. It uses the TOTAL Food Release nonstick system of raised circles that provide extraordinary food release to reduce surface abrasion, chipping, scratching and staining. It is highly versatile and can be used in the oven, on all stovetops and is even induction cooktop safe. It is easy to clean as it is dishwasher safe and features PFOA-free nonstick interior. The stainless steel handles wrapped in silicone offer a comfortable grasp. It heats evenly and the handles remain cool. You may find that it takes a long time to heat. There are those who feel that the non-stick coating is poor and scratches easily. The Circulon® Symmetry Hard Anodized Nonstick Cookware has many good features with the most notable ones being the ability to cook without oil and its awesomeness with induction cooktop. They are also durable and elegant hence make a perfect addition in your kitchen. The Rachel Ray Cucina 12-piece cookware set includes 1- & 3-quart covered saucepans, 6-quart covered stockpot, 8.5- & 10-inch skillets, 3-quart covered sauté pan and nylon spoon and slotted turner. It is touted as elegant cookware that promotes fast and even cooking with its easy to use and time saving pots and pans. Notable features include durable aluminum and hard enamel porcelain exterior, non-stick polytetrafluoreothylene interior, rubberized stainless steel handles that are dual riveted and shatter-resistant glass lids that seals in heat, moisture and flavor. The espresso-colored PFOA-free nonstick releases food effortlessly with little to no oil or butter and is easy to clean. The cookware is oven safe up to 400oF and is suitable for all stovetops except induction. It is an imported product that comes with a limited lifetime warranty. What makes Rachael Ray Cucina one of the best Nonstick Cookware Sets? It is made of durable aluminum and sturdy hard enamel porcelain that promotes fast and even cooking while eliminating hot spots that usually burn food. The PFOA-free interior releases food easily and is easy to clean. Its handles are dual riveted and made of rubberized stainless steel hence they are strong cool. It uses shatter-resistant glass lids that fit tightly to seal in heat and moisture for faster cooking. It is versatile and can work on all stovetops except induction and it is also oven safe up to 400oF. The earthy, rustic colors together sturdy construction and hard enamel exteriors add elegance and modern touch to your kitchen. The nylon spoon and slotted turner are a perfect addition. It is hand wash only. There are complaints of the exterior fading and even melting onto the stovetops. The Rachael Ray Cucina Cookware Set has good features that can make any cooking experience one to remember. It is sturdy and durable; heat food fast and evenly, releases food easily and is easy to clean. Majority of users are happy with this product and it could just be the one that you have been looking for. Anolon cookware set is durable with an excellent nonstick performance. The 11-piece set includes 1.5- & 3-quart covered saucepans, 8-quart covered stockpot, 8- &1 0-inch open skillets, 3-quart covered sauté pan and 12-inch shallow grill pan. It is made of three layers consisting of an aluminum core sandwiched between hard-anodized aluminum exterior and Dupont Autograph® 2 nonstick interior. The cookware also uses Ergonomic SureGrip® dual-riveted handles that combine stainless steel and silicone and are oven safe up to 400oF. It is stove top suitable for glass, ceramic, electric and gas but not dishwasher safe. Other features include shatter-resistant glass lids, metal utensils safe and lifetime warranty. What makes Anolon Advanced one of the best non stick cookware sets? It brings elegance to your kitchen thanks to the graceful tulip shape and a sleek bronze finish. It has durable hard-anodized construction that enables fast and even heating and reduces hot spots that can burn food. The handles are strongly riveted, cool, offer confident gripping and oven is safe to 400oF. It is safe for metal utensils. It uses shatter- resistant glass lids that allow monitoring of food without lifting. The grill pan is also a plus. It is not dishwasher and induction stovetop safe. The Anolon Advanced Bronze Hard Anodized Nonstick 11-Piece Cookware Set has the features of any good quality cookware that you can get and you will love it not only for its elegance but also durability and performance. It is a cookware set that you are not likely to regret buying any time soon. The Simply Calphalon Nonstick Cookware Set is described as a must have cookware set for any cook. It is made of hard anodized aluminum construction which is known for its durability, excellent conductivity, even cooking and ease of cleaning. The interior consist of PFOA-free double coating of Calphalon® Nonstick that releases food effortlessly and is easy to clean. The lids are made of tempered glass to allow you monitor your food without lifting while the handles are made of contoured silicone over stainless steel for comfortable grip. The set includes 1- & 2-quart covered saucepans, 6-quart covered stockpot and 3-quart covered sauté pan together with 8- & 10-inch omelette pans. It is oven safe up to 400oF and comes with a limited warranty of 10 years. What makes Simply Calphalon one of the best non stick cookware sets? It is made of hard – anodized aluminum with the benefits of durability, high conductivity and even cooking. It has an interior PFOA-free nonstick surface that releases food effortlessly and is easy to clean. The handles are strongly riveted, comfortable and secure to grip thanks to the contoured silicone material over stainless steel. The lids are made of tempered glass for the safe monitoring of food while it is cooking. The set is elegant with a grey color finish and black bottoms. The flat bottoms enable them to sit comfortably on stovetops such as gas, halogen, electric and glass but not induction. It comes with a 10 year limited warranty. You may find the pans to be small for majority of cooking needs. The Simply Calphalon Nonstick 10 Piece Cookware Set is an excellent cookware set that has many good features. It is durable, versatile and good performance that every cooking enthusiast will love. Many users are happy with their purchase and it is ideal for everyday cooking for all types of food. Not all of them are dishwasher safe and they should be washed with hot, soapy water and rinsed well for first time use. Unless it is a Calphalon, it is necessary to season your nonstick cookware before using it by first coating it with cooking oil and then baking and wiping it clean using a soft towel. When using nonstick cookware, use it at lower temperatures compared to standard cookware and should not exceed the recommended safe temperature. Although there are nonstick cookwares that are metal utensils safe, you should avoid using metal utensils on them to avoid damaging of the coating. You should instead learn to use plastic, wood, nylon, silicone or rubber utensils. Unless indicated, do not place them under the broiler or bake at temperatures above 450oF. Wash nonstick cookware carefully and thoroughly every time because any remaining residue will make the food to stick. Allow nonstick cookware to cool completely before washing to avoid warping it permanently. It should be stored carefully and safely usually on a hanging rack or even in a cabinet but by layering soft cloth between them to avoid scratching. The lifespan of your nonstick cookware set can greatly extend if you use, clean and store it carefully as recommended. Otherwise, it will burn, chip or scratch within a short time of purchase. When they are well taken care of, nonstick cookware will last long, perform well and deliver chef-quality food for a long time. Please also have a look at our overall best cookware sets.